3. Container of your choice; the one I purchase is metal with a patina finish and it came with a fitted plastic liner inside (recommended if you're using live plants that will be watered). 4. Potted succulents - I purchased 5 varieties from IKEA for only $2.99 each. If you don't want to use live plants, there are some pretty great plastic succulents out there that look real. 5. Fill the container with soil; depending on the shape of your container and number of plants, map out the placement each one, spacing them evenly. 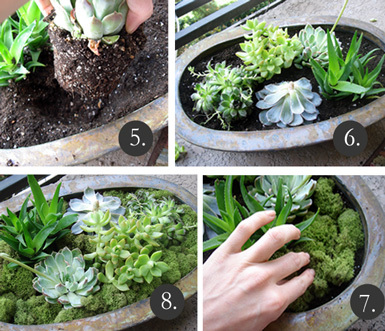 Scoop out small amount of soil and plant each succulent. 6. 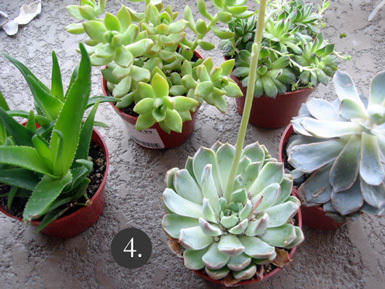 Once all succulents are planted, add more soil and spread evenly around to create an even surface. 7. 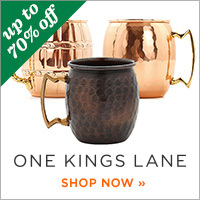 Add the reindeer moss - a little goes a long way, so you don't need to use much. It has a sponge-like texture and is easy to mold around each succulent. 8. Be sure to cover the surface evenly with moss so the soil isn't showing through. 9. Strategically place a few shells, pebbles, etc. around the container, on top of the moss. I used seashells that I collected on the beach a few months ago and purchased a bag of flat tumbled stones. - Break the curly willow in half or in thirds, depending how long each stick is, and place the top portion along the center of the planter. I used about 5 sticks and staggered their heights. 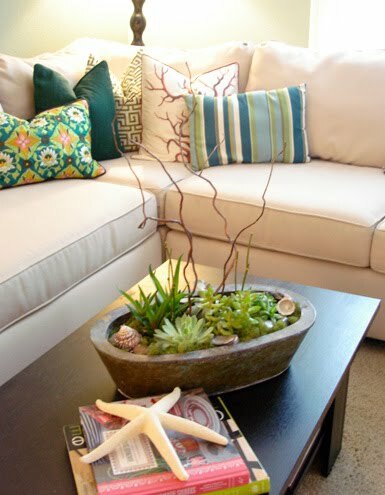 FINAL RESULT: A beautiful succulent centerpiece that can be placed on a dining table, cocktail table, or console. I took this photo of the centerpiece placed on my living room coffee table. Sometimes I set it on the center of my dining table or outside on our balcony - I love its versatility! So pretty. I love succulents. What a great project! 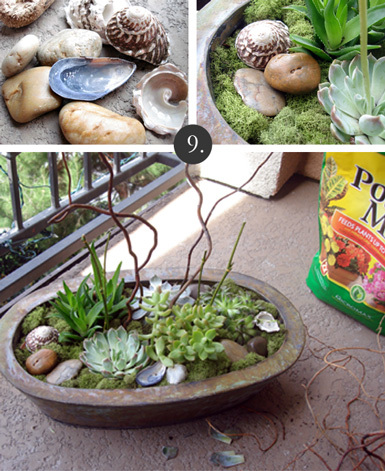 Love the succulents:-) I need to make one for our bathroom! I love ikea for their plants. I have some succulents that I purchased 2 years ago and they are doing really well. I love it !! I want to make one. LOVE this! It can go pretty much anywhere and is quite easily made. So it's absolutely perfect! 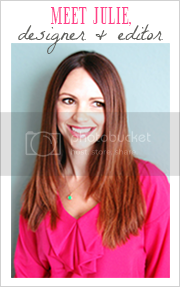 Thanks for sharing with us, Julie! I have a succulent obsession! Gorgeous centerpiece for your space. Beautiful! Must copy! Thanks for the tutorial. 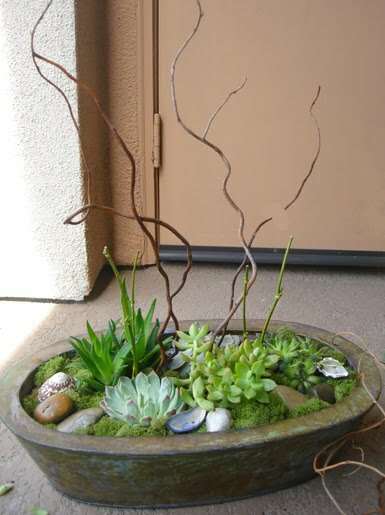 Would you mind sharing where you bought the planter and curl willow sticks (I live in SoCal too!)? 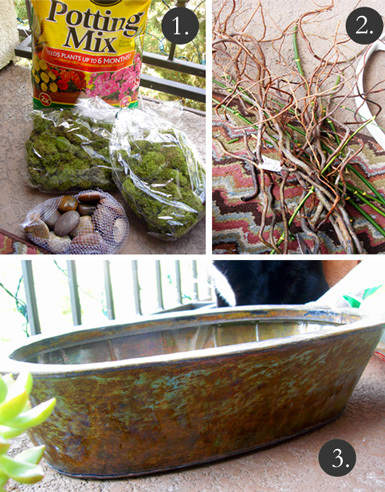 manisha - i got the curly willow and planter from Shinoda Design Center in Santa Ana...they also have a location in San Diego.